Prior to showing your home, and after a thorough evaluation with a Real Estate Professional, you should have the following: a realistic idea of the price, how low you will settle, what conditions you will accept; and what terms would be agreeable. With this information, you are prepared. When an offer is presented, you will be able to compare it to your initial guidelines. Your Real Estate Professional will evaluate these offers and, hopefully, arrive at one that comes closest to your objectives. At the same time, however, your Real Estate Professional will likely exercise some leveraging power with any other negotiable items. A Real Estate Professional works on your behalf, considering all the factors, you as a buyer, and the seller, to work at an agreement that is satisfactory for both parties. It comes down to persuasion and negotiation. Your Real Estate Professional has specialized training in this important area. When you have found the home you want, you will need to make a formal written offer. This is called an “offer to purchase.” This is a legally binding document which should be completed with due care and diligence. This document outlines what you, the buyer will give (a combination of price and terms) to the seller in exchange for the home. It is highly recommended that a lawyer or real estate agent prepare the offer on your behalf. This will reduce any financial or time errors. Review the document before signing. If there is anything you do not understand, be sure to ask for clarification. Once signed, the document is binding and you could face consequences upon default. Buyer information. Seller information. This includes items (for both parties) such as name, legal and civic address of the property to be purchased. Detailed financial information: deposit amount, refund of interest on deposit, down payment and mortgage, etc. 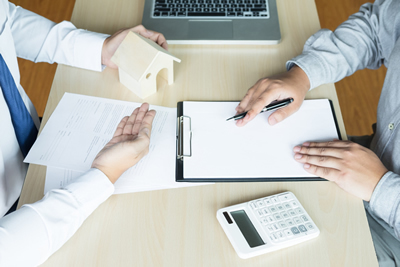 If you are assuming the seller’s mortgage, complete details of this obligation. If the mortgage is not being assumed, the owner needs to provide supporting documents, to show clear title (free of all encumbrances). Existing mortgages must be discharged with sale proceeds on closing. Offer time frame. This is the period for which the offer is valid. The offer either expires or is up for re-negotiation on that date. A Real Property Report is mandatory by the financial institution for mortgage approval and by the lawyer or notary for transfer of ownership. This certificate indicates outdoor improvements, from the date of construction, such as decks, patios or pools. You and your agent should thoroughly review every detail. If there is anything you do not understand, ask! Before you accept and sign the offer, it is a good idea to have your lawyer review the offer. This way, you can be confident nothing has been missed, everything is legally accurate, and your interests are protected. You could handle the offer in several ways, according to your timing and needs. If you are not attached to the home you want to buy, you could try and present a very low offer. This offer is considerably lower than the asking price. However, a low offer may be successful if the seller is desperate to sell. The seller could present a counter offer. Alternatively, the seller might turn down your offer completely and refuse to sell the home to you. Your Real Estate Professional can offer some professional guidance on presenting a fair and reasonable offer. When you have fallen in love with a home, and you really want the home, you could present your best offer. This offer leaves no negotiating room, but if the market is hot, it is an offer that will attract attention. Your Real Estate Professional can advise you on the best way of making an offer that is fair and reasonable, without indicating to the seller that you are desperate. Why pay more than necessary. In a seller’s market, perhaps you may want to pitch a price, along with the multiple offers probably on the table. This often happens when there is a bidding war for the property. You could up the offer, or walk away from the home. When your offer is firm, then you are telling the seller you are willing to purchase the home without any conditions. Upon acceptance of the offer, you have purchased the home. This is a legally binding agreement. Upon default, if you are unable to close, you could lose your deposit and face legal consequences. Be sure to confirm your financial matters prior to signing any documents. A conditional offer includes stipulations on the purchase. These could revolve around a home inspection, financing, or sale of your existing home. If any of these conditions are not met then the home is not sold. A sum of money, usually no larger than 3-5% of the purchase price, shows that you are serious about purchasing the home. This amount will be applied against the purchase of the home when the sale closes. Upon reviewing your offer, the seller can accept it as is, reject it or return with a counter offer. A counter could be in regards to price, conditions, closing date or other variables. The offers will continue between the seller and the buyer, until both parties have come to some agreement, or one party stops the negotiations. Once the offer meets with your approval, you will want to secure the transaction with a deposit. This indicates your intention to proceed with the purchase. When you have accepted the offer, you will proceed through the closing details until you move in. The next article in this series explains the closing procedures.